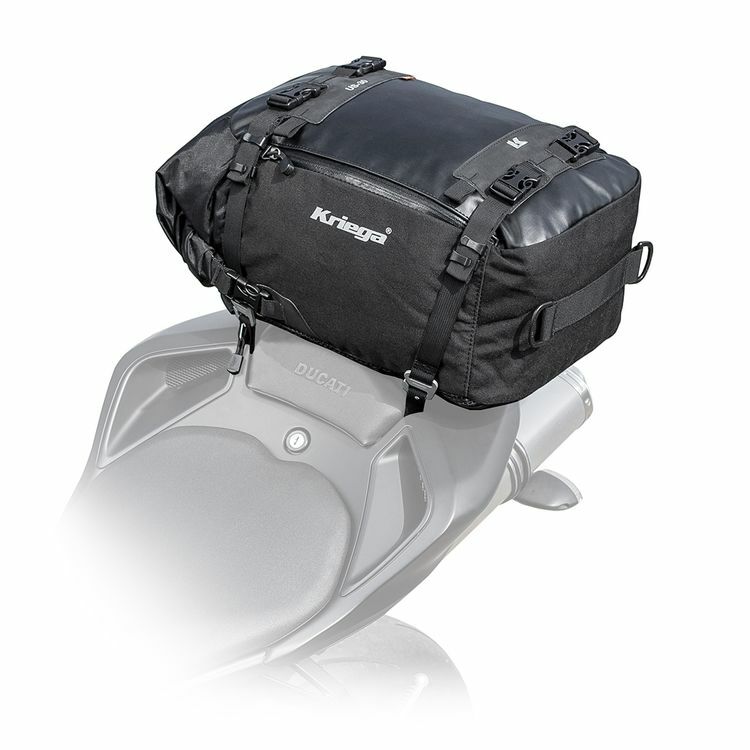 The Kriega US-30 is 30-litre capacity 100% waterproof motorcycle tailpack. Unique design solution enables fitment can fit directly to the bike's subframe or solid mounting under the seat. The US-30 also comes equipped with removable shoulder and waist straps, so it can be carried courier style, on or off the bike. The Kriega US-30 motorcycle tailpack is designed to work perfectly with pretty much any motorcycle, via a super secure attachment to the sub-frame. The pack is easily attached/removed by 4 x quick-release buckles, and no extra bungees or rain covers are required. The Kriega US-30 tail pack utilizes the latest generation of fitting straps: US Alloy Hook Straps allow tailpack combinations of up to 90-liters to be carried with confidence and convenience. Easy on/off with no loose straps remaining. Custom CNC milled, aircraft grade, 6061-T6 alloy hooks attach to the four discreet web loops located on the sub-frame of the bike. Fitting method is particularly suitable for traditional one-piece motorcycle seats and bolt-on seat pads/racks, as well as standard seats. US packs can be mounted inline or across the seat. See US Alloy Hook Strap page for full fitting instructions. I wasn’t sure how big a 30L bag would be, but was pleasantly surprised when it came it. I like the simplicity of design. I wish they had female-female clips for when you ride without a pack, to prevent having to remove the clips off your bike, or having them flap around in the wind. It would also be nice if they had the loop system like most military packs for more attachment options. I recently purchased this and used it this past weekend for for an overnight camping trip. I was very surprised how much gear you can fit. My cooking gear, clothes, food, 2L water, my camp axe, food, "toiletries" bag, first aid kit, and fire kit all fit with room to spare! It also has an external waterproof pocket that I put quick access items in (snacks, headlamp, wipes, etc.). It was very easy to attach and detach with either the snap clips or the hard connection to the bike. The only downside is it doesn't have a handle so once you take it off the bike, carrying it around is a pain unless you take out the should strap and connect that. Installation was also a breeze. I am not at all mechanically inclined and it took me about 20 minutes. The connection loops stay on the bike so you can always quickly connect/disconnect the bag. I would recommend this to anyone looking for a good waterproof top bag. I borrowed the Kriega 30 from a friend for a 3 day moto camping trip last fall and I was sold immediately so I picked one up for myself. Using on a Triumph Bonneville T120 with grab bar. Super easy install of straps by removing seat and using frame and removal and the bag (essentially a stuff sack) holds a TON of gear. My only critique would be - it would be nice to include some sort of handle on the end to carry it. It’s awkward to carry if you don’t want to use the shoulder strap. I loved this pack. It was perfect, unfortunately I was in a very serious accident with a car that didn’t see me and the bag was destroyed. I got to enjoy this bag for approximately 1 month and it is definitely waterproof and durable. Holds a full weekends worth of clothes - connection to bike feels secure and is simple to install. Not the easiest to carry when off the bike, but can't beat the amount you can carry in it while on the bike. Rugged and well chosen materials. Easy to attach to a bike and quick removal. The roll top will keep contents dry, but it is a bit tedious to get to items through 3 snap-clips and the roll...so things for quick access should go in the zipper pocket. The straps that mount on the bike don't require tools, and move bike to bike in minutes. Zipper pocket on top for 'pretty quick' access items and a vented pocket on the the side useful for wet items. Now, a few things Kriega could have done better for a bag this expensive. 1) Shoulder strap won't adjust down to a useful size for any extended use. I've used a tie-wrap to reduce the length but will likely just replace the strap. 2) This bag could really use a simple fabric handle to carry between bike and shelter. As-is you carry it like a grocery bag - not very convenient. 3) While the main compartment is white (great feature), the side zipper pocket interior is black - bad choice. 4) The zipper pocket could really use a few interior pockets since it's where I try to keep small items that need quick access - like keys when off bike, sun/reading glasses, passport, small tools, and other smaller items. A lot of bags put a tether in pockets like these so you can retrieve keys easily. So, I use zip loc bags to hold stuff and store them in the Kriega zipper pocket. 5) There's no way to use the Kriega mounts to have the vented pocket on the top - which is how I'd mount it if I had damp clothes drying in the vented pocket. I do accomplish this using some bungy cords, but then why do I need the fancy Kriega mounts? Just add snap clips to the bottom/vented side. Overall a good useful bag I'll use as carry-on flying to Nepal then as a tail bag on the motorcycle tour. The simple features mentioned above would make the bag much easier to use. Fantastic bag. Great looking and so easy to use. Must have. Installation was a synch after finding how others attached the bag on their bikes online. I ride duc monster 796. haven't ridden with it yet but i plan to soon, soon as i buy all the things i need. I plan to do a little moto camping for those long canyon riding days and I'm too fatigue to ride back home. Modular so it can be used for different types of trip and bikes. Better than fixed case. it is lighter and better balanced. Your bike tail is still slim and allow you to get through heavy traffic in all the place where it is legal to do so. And most important the only truly 100% waterproof bag. Used it so many times in all types of pouring tropical rains for hours and never get a single drop of water inside. the only drawback is it price. All college books, computer, liners, shoes, etc. It's bottomless! Installs quickly and stays put. Should have bought one a while ago.